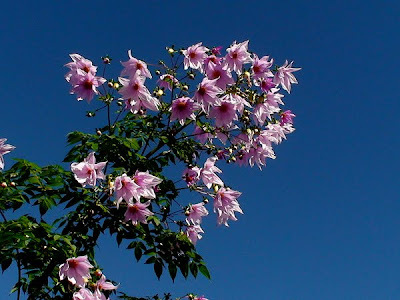 Native to South America, the tree dahlia - Dahlia imperialis can be grown farther north with proper care and maintenance. Hardy to Zone 8, it is becoming increasingly popular among gardeners in the southern and western United States, and even grows wild in parts of Hawaii. This tall, late-blooming perennial will add drama to any garden. 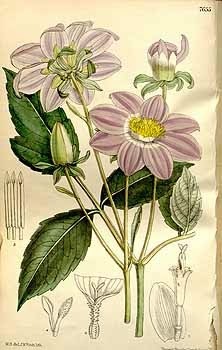 Averaging between 10 and 15 feet in height (though some report plants as high as 30 feet), the tree dahlia blooms in autumn with pink, lavender or white flowers about 6 to 7 inches in diameter. If you're looking for a sun-loving plant to add a little height to your garden and provide a splash of colour the Dahlia imperialis may be the perfect addition to your landscape. Dahlias thrive in sunlight. Full sun is best, though some gardeners have reported success with as little as half-day sun. Soil for dahlias should be rich and moist but can range from sandy loam to slightly clay. Drainage is extremely important, as dahlias are sensitive to both too much and too little water. Consider adding perlite or horticultural grit to your soil for improved drainage, especially if you live on the West Coast, where winters are particularly wet. Plant your tree between 8 and 12 inches deep, and mulch it heavily. Although they like full sun, tree dahlias also need to be sheltered from wind as their bamboo-like stems are brittle and break fairly easily. You may also need to stake the stems and tie every foot or so of growth, leaving the top few feet free. Pieces of nylon make great ties because they'll stretch as the plant grows, unlike plastic or string, which may cut into the stem, causing damage. Tree dahlias are sensitive to frost, so if your area experiences 'colder than normal' temperatures, especially overnight, you may want to cover your plant to protect it. Use burlap, linen or even newspaper, which will let the plant breath. Plastic will trap moisture on the plant, potentially doing more harm than good. After it flowers, the tree dahlia may prune itself, reducing its height to just a few feet. If it doesn't, you'll need to cut the stems down for winter. You may also wish to trim new growth by up to half. If you want a bushier, rather than a taller, plant, trim the top of the dahlia tree every few months through the growing season. Don't be surprised if your tree dahlia does not emerge with the rest of your herbaceous plants come the following spring as they are particularly late to appear, It isn't unusual for them to start their growth as late as mid-May, but don't worry as once they get going they are extremely vigorous.